GeronNursing & Respite Care in New Milford is celebrating its 30th year this year. The agency is owned by Michael Gold, second from left in back. 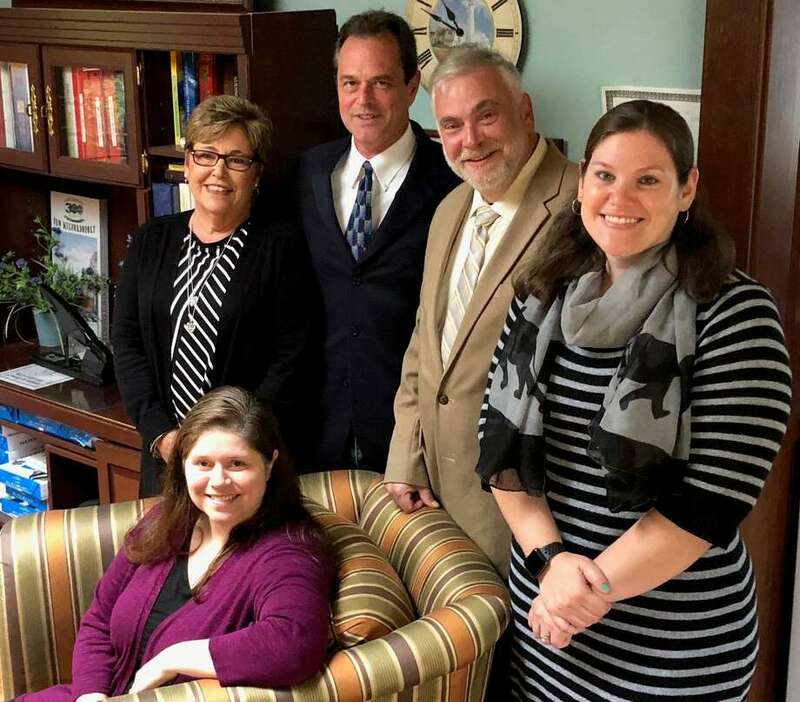 Joining Gold are Alyssa Krasowski, on-call coordinator, front, and in back, from left to right, Linda Fecko, director of human resources, Roger Arguello, chief finance officer, and Jaime Pol, assistant administrator. When Michael Gold purchased GeronNursing from his mother in 1993, so she could move to California, he had no idea that five years later she would rejoin the agency. “She said, ‘I’m coming to work for you,’” Gold recalled his mother saying when she told him of her planned move back to Connecticut. The timing was perfect. Gold and his wife had just had their first child, and his mother, Lois Morrissey, and her husband wanted to be closer to family. Morrissey returned to the agency she founded in 1988, taking on the role of geriatric care manager, a position for which she had become certified while living in California and still holds. The business has continued to blossom throughout its 30-year history, with Gold at the helm as owner and president. To that end, the agency, which is licensed through the state Department of Consumer Protection and registered with the Department of Labor, offers quality care that is “tailored to each client’s wants and needs,” he said. The private duty agency, which is housed in an historic home at 42 Main St., provides geriatric care management services; part-time and full-time nursing; end of life care; registered nurse and licensed practitioner nurse services; certified nurse’s aide and personal aide attendant services; homemakers; and companions. Gold described the stress and anxiety — stemming from navigating appointments and coordinating necessary care — many families encounter when a loved one endures a health crisis. “People have no idea (what to do) when it comes to crisis of a loved one,” Gold said. Geron staff will review each case individually, talking with the client and/or any caregiver(s), and make a coordinated plan to ensure the client receives the necessary care. The goal is to plan for care that is “family-client driven, as long as it’s within medical guidelines,” Gold said. Care may be short or long term, and may be periodic, depending on a client’s health needs. Matching a staff member with a client is also key, Gold said. Josephine Barrett of New Milford, a retired LPN, said she has a regular caregiver but if she isn’t available, Geron will send someone that provides the same quality of care. Barrett said she feels “safe” and “accommodated” with the services she receives through Geron. Gold said he takes pride in his staff, all of whom are thoroughly vetted through interviews Gold conducts himself, as well as through fingerprinting, numerous references and other processes. Geron staff are employees of the agency, which carries the liability and is bonded, not subcontractors, Gold noted. Deborah Bain, founder and managing director of Prism Health Advocates in Kent, raved about Geron’s prompt communication and professionalism. Morrissey, a registered nurse who earned a BSN while working full time and doing private duty care, was sparked to open GeronNursing at 33 Main St. in Newtown after being in the field for a few years. A year after she opened the agency’s doors, she reached out to her son, who had graduated with a B.A. in psychology three years earlier, and asked him to come aboard. Initially Gold worked part time doing invoices and other tasks. Soon, he assumed the full-time role of director of operations. The agency moved to New Milford in 1989 and was housed at several locations before Gold purchased 42 Main St.
“I love this place, I love the house,” Gold said. Gold said the agency “turned a corner” when it moved to the Village Green because it became recognized as a long-term employer, employing 100 people, in town. The agency accepts private pay, long-term insurance and Medicaid. For more information, call the 42 Main St. agency at (860) 354-7698 or visit www.geronnursinginc.com.